I went into this film very cautiously. Regrettably, I knew next to nothing about the French filmmaker who helmed White Material, save that her film from last year (35 Shots of Rum) was rumored to be better than this. When film friends and cohorts recommended it to me, I figured I would give it a shot on DVD, and I’m glad I did. 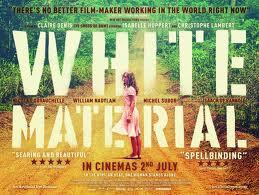 Aside from the mesmerizing performances given by Bankole and Huppert, this film is made with such energy and vision that my hesitation in viewing it evaporated within the first few seconds. Not only is seeing this film a worthwhile experience, its poetic frenzy of sounds and images transforms its colonial themes into something much more universal. The film is set in an unnamed African country in an unknown time, just on the cusp of a civil war. The warring sides are never named, and their conflict seems to have no real origin. The one thing we do know is that the native Africans hate the white colonialists for their past oppression, and the colonialists fear the Africans, by whom they are undoubtedly outnumbered. Amidst this mysterious conflict lives a woman, played by Isabelle Huppert (The Piano Teacher), who owns and runs a coffee plantation. It has stopped being profitable, and she seems to be fighting an uphill battle to maintain it. Furthermore, local officials have strongly recommended she leave town, as rebels will likely seize her plantation, or worse, kill her and her family. But the film addresses a serious question. How do you uproot and leave? How can you leave your world behind so easily? Grappling with these questions, it seems that Huppert’s character slowly descends into a kind of madness, one seemingly stimulated by and manifested in the chaos that surrounds her. The world she lives in is a hostile one. War, bloodshed, and extreme violence all break out regularly. A rogue revolutionary seeks refuge on her plantation, and all the while she is being told to leave by everyone, regardless of race or political persuasion, and with different ends in mind. Some want her to leave because she is white, others fear for her safety. And yet she stays, because this is the only place she knows. Amy Taubin’s essay on the film, included in its Criterion release, points out the strangeness of Denis’ heritage. Denis grew up in Africa, in a French colony, until she was 13, at which point her parents brought her “back home” to Paris. Denis felt as though she didn’t belong in either place- as white material in Africa, nor as a colonial child in Paris. In each of her supposed “homes” she became an outcast. It is easy to see this staggering lack of cultural identity in Huppert’s character. While she can easily see the hurricane of destruction headed her way, she can hardly go anywhere else. Much like the plantation owners in Coppola’s Apocalypse Now Redux, she would prefer to stay and hope that the rebels leave her alone, isolated and forgotten in her own fading manor. It is this sense of loss and confusion that elevates the film. The lack of an exact setting, while generally taken to be “somewhere in Africa,” lends a certain universality to the film. This is not just a film about a plantation owner who refuses to give up her land now that the oppressed have risen against her with a great fury. It is about a woman who has no homeland, no refuge, and like the unanchored captain, chooses to go down with the ship. She has the audacity, however short-sighted it looks from this side of the screen, to cling to the one thing she knows for sure, rather than risk being tossed about in the perpetually violent and unforgiving world that awaits her outside. This entry was posted in Reviews and tagged DVD, white material. Bookmark the permalink.